Warmer weather is just around the corner and it’s time to freshen up your home for the change of seasons. Spring cleaning always includes the basics: vacuuming and mopping, scrubbing the bathrooms, and dusting all the surfaces in the home. There are always forgotten places on a spring cleaning checklist, so remember to include these commonly missed areas for a cleaner home. Dirty light fixtures can affect your indoor air quality. Your spring cleaning checklist should start with the top of the home, and this includes your light fixtures and ceiling fans. Go through all the rooms in your home with a feather duster, rag, and a bottle of all-natural cleaner and wipe the inside and outside of all the light globes, ceiling fan blades, and motor covers. 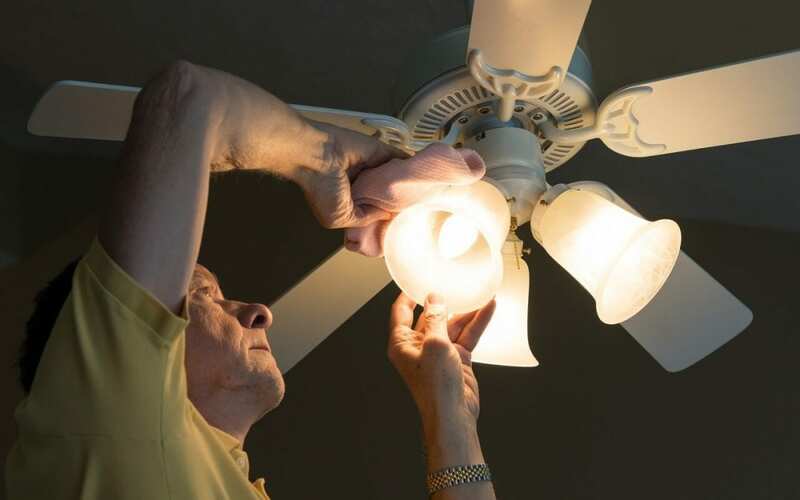 While you are up there, switch the rotation of your ceiling fans to counterclockwise. Everyone includes wiping down tables and chairs on their spring cleaning checklist, but few people remember to clean the undersides. Dirt, spilled food, and cobwebs can wind up underneath your kitchen or dining room furniture. Get under there with a scrub brush and spray bottle of wood cleaner and wipe away any grime. This step of spring cleaning should happen before cleaning the floors. Cleaning your oven and refrigerator usually make it on your spring cleaning checklist, but your small appliances like toaster ovens, blenders, and coffee makers sometimes don’t. Empty out the crumb tray of the toaster, disassemble the blender and scrub all the parts, and run a cycle of hot water and white vinegar through the coffee machine. Don’t forget other small appliances like food processors, crock pots, and any other kitchen gadgets. The trashcan is the dirtiest thing in your kitchen. Your garbage harbors germs and bugs when it doesn’t get thoroughly cleaned often. Spring cleaning is the perfect time to get this task done. After taking out the trash, put on some gloves and bring your garbage can outside. Spray it out with a hose and then scrub it with some disinfectant cleaner, inside and out. Spray it off again and then let it air dry or wipe it down with paper towels. Try to get in the habit of cleaning your trash can every month. Guardian Home Inspection Services provides home inspections for properties in Southwest Michigan. Contact us to book an appointment.